Gift me @phuein in-game, if you have extra crowns and appreciate my addons. (Can even ask which DLC I missed.) Thank you! This is a changed, updated, and fixed version of the addon Notebooks by Glen348 that is now outdated. There is only one notebook now, instead of three. I personally use Shift+F or F1 to display the notebook (KeyBindings -> User Interface -> Notebook.) /nb will also display it. And /nbs will display the settings menu. After writing meaningful changes to your Notebook, you must use /reloadui (in the chat) to immediately save them to file! Otherwise, there is a risk that a game-crash will lose all those changes. Fixed a bug with page options displaying incorrectly for new pages. Fixed and changed when confirmation dialogues appear. Fixed the Title and Page from showing and allowing writing, when there is no page selected. The button in chat is now positioned better, and its position can't be changed. The settings menu is now organized by categories. Max characters per page is 1,900. NOTE: Unicode characters take extra space! And up to 3,000 characters can be displayed for editing purposes. Page moving Up / Down buttons for sorting pages easily. Text Formatting display mode that shows colors, images, and more. It's on by default when not editing the text. An option in Settings to select a default New Page Title. An Account-Wide mode that uses the same Notebook for all characters in your account. Its pages & settings are separate and do not affect the characters' pages & settings. NOTE: Each character has to activate it for itself. 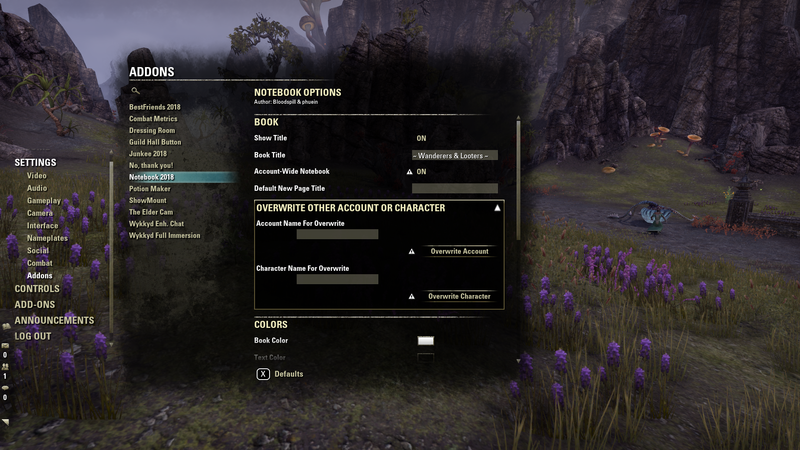 An option in Settings to overwrite the Account-Wide Notebook with data from the current character's pages & settings. An option in Settings to disable /read and /idle when opening and closing the Notebook. An option in Settings for Line Selection with Tripleclick (Doubleclick+1). BUG: Doesn't work correctly with UTF/Unicode characters. Unfixable. An option in Settings to change Text Selection highlighting color. Scrolling control (and fix) for Formatted and Edit Text modes. An option in Settings to disable Formatted Text mode. An option in Settings to change the text color in the Notebook. When editing a page, a character counter will display at the bottom-right. An option in Settings to overwrite another account's Account-Wide or another character's Character-Wide Notebook (same account or another) on the same PC. Virtual Notebook to keep track of everything you want to remember! ...allows you to create as many pages as you wish to write down. • Optional confirmation upon New, Delete, Undo, and Save & option to turn them off. • Chat window button for easy toggle and adjustable. • Color tinting of the notebook cover & chat button. • /nbs displays the settings. Seerah, for the base coding. Circonian, for help with problem solving. And here's all the extra special symbols I found that work in-game, a la notebook / chat. ...thanks for keeping this essential, to me at least, addon up to date. By the way, thanks for the kind words! I appreciate people enjoying my work. As a follow-up, the updated Notebook 2018 4.53 now lets you overwrite Notebooks between accounts and their characters, including the same account. Do note, while I tested this in the save file, I don't actually have two accounts to test this on cleanly. However, I've seen no reason to think it doesn't work. Everyone, please read the last item in the addon's description page for more information and recommendations. Since the latest ESO update, I did a little "spring cleaning" and got rid of some outdated addons. 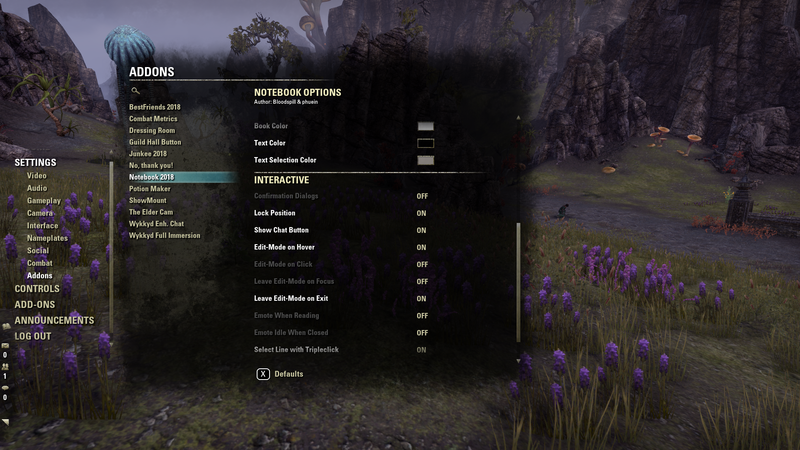 Doing that I noticed that an even earlier version of the notebook addon you reference, this one, apparently uses a code synchronizing the addon across any ESO accounts on a computer. I'm now wondering if there might be a way to make this another option in your addon in addition to saving per char and account-wide? What a curious feature request. I never even considered this. The old addon doesn't seem to be doing this intentionally. But reading up on this, it looks like this is doable. I'll add an option to copy your AccountWide Notebook into another AccountWide Notebook by the account name, and post an update here. Last edited by Phuein : 03/29/19 at 04:19 PM. thanks for keeping this essential, to me at least, addon up to date. It's alright. I admit the UI could be improved, or at least I (or someone) could take a screenshot and add some text tips overlay for newcomers. Inside your Notebook open, make a page (green plus button on the top right of the book), click the new item to open it (in the left listing), and then you'll see the default title and empty text on the right. Clicking the text will let you edit that. Clicking the title (on the top right) will let you edit the title. AHHH!!!! Thank you so much!!!! That shouldn't have been that hard to figure out on my own. Last edited by Phuein : 03/18/19 at 05:09 PM. I'm glad to help clarify stuff. Is there a way you can make it so a person can add a title or name to each entry should one want to? Please? In what way, specifically? You can already set the title for pages and books. When you create a new page (or edit an existing page), you can just click in the default title and edit it any way you want, change it, delete it or create something new. You may have to "save the page" before you see the change on the left side with the titles of your other pages. Phuein, thank you for the additional insight on the issue. I didn't realize I could do a /reloadui to save if necessary. Some days ago, I tried each of the versions and for me none saved their savedvariables files until I logged out. (However, I did not wait longer than 10 minutes or try the /reloadui). I also thought of the possibility other versions exist that are not currently available. In any case, it was interesting to see the evolution of the Notebook. TL;DR No changes are necessary. Addon updated with the Description section to make sure users know to backup their Notebook and to use /reloadui after writing meaningful changes. This uses the script's assumption (in the .txt) that NBUIDB (renamed in my version) is the file to use. HOWEVER, I never heard anyone say that the old Notebooks saves immediately! And I admit that curiosity gets the better of me. Can a second person confirm this? I'll do it myself in the coming days, unless somebody can deny this by testing the old version, too. EDIT: So I just tried the old addon, and as expected it does not save immediately. The two addons save the same way - which means the game saves it in its own way. I appreciate all the compliments and love hearing that people still enjoy my work! Post on the forums to ask the game dev's to clarify their solution, or fix it. Update this addon's description with a recommendation to do /reloadui after meaningful changes. This function prioritizes the addon to be saved before non-prioritized addons. After a save, it will no longer be marked as a priority. Last edited by Phuein : 03/16/19 at 04:20 PM. I don't know how Glens version got around this. It seems saving immediately may not be possible. Glens version saves the notes file on save button press; i.e. immediately. Your version saves on logout, which means, all changes are lost whenever the game crashes, which happens quite often. Unfortunately, you are wrong . I am still using Glens version and it saves immediately. So I won't switch to this one until it does too. Did a little reading on the issue, and it seems the way data is written to the saved variables file is an ESO limitation because to do otherwise addons can be created that "cheat." Read that from some pretty knowledgeable authors, however that is old information. It seems to still be true since addons I use all update the saved variables file after I log out.